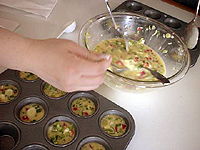 Spray little mini muffin pans with a non-stick cooking spray. Melt butter and saute bell pepper and onions till soft. Wait till cool and then combine all of the other ingredients and bake in the oven for about 8- 10 minutes.